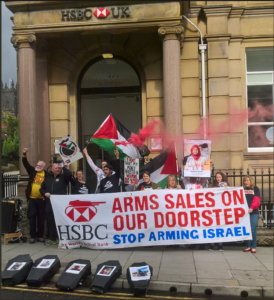 Home / Blog / Latest news / UK-wide protests tell HSBC: Stop Arming Israel! 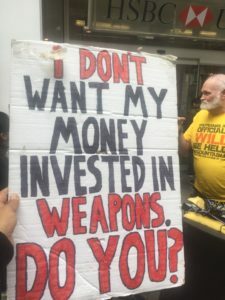 Over 35 protests hit branches of HSBC on Saturday as the national day of action sent a clear message to the bank to divest its shares in Elbit Systems and other companies arming Israel. 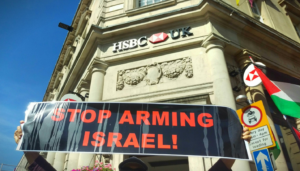 ‘Protests in over 30 HSBC branches over its links with companies arming Israel‘, Morning Star, 16 Sept 2018. 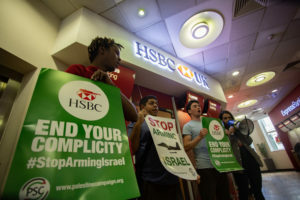 ‘Protests target HSBC over shares in Israel weapons company‘, Middle East Monitor, 17 Sept 2018. ‘HSBC “making a killing” from Israeli military‘, The New Arab, 17 Sept 2018. Photos from protests across the UK can be seen on our brand new Instagram account here. Some highlights are below. Watch a video of the action on our YouTube channel here. Read more about the Stop Arming Israel campaign here.